Double; medium to large, very dark red nearly maroon. 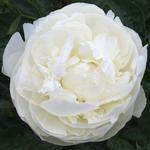 Color brilliant and clear throughout; petals large with good substance, well defined, broad, form open revealing stamens. Golden yellow stamens throughout. 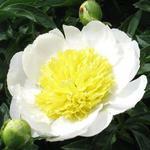 Flower form attractive, pigmentation perceived to be outstanding. Plant form and habit below acceptable ornamental standards. This seedling represents an intermediary step in plant breeding, bringing together exceptional genetics from both parents. 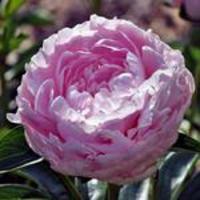 Herbaceous Hybrid.�Parentage: 'Blushing Princess' x ['Sable' x 'Eclipse'].�It is assumed to be fertile both ways, tetraploid.�This cultivar is available to plant breeders only. 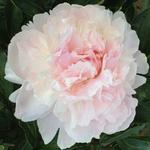 Please Email your order to nursery@hpeonies.com.